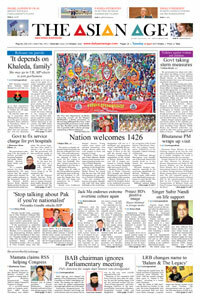 The nation on Sunday celebrated Pahela Baishakh, the first day of Bengali New Year 1426, with much enthusiasm.The morning started with the chirping of birds as usual, but the singing of "Esho hey Baishakh esho esho" echoed everywhere in Bangladesh to give the day a really festive dimension. People from all walks of life throng different popular and historic spots in the capital and elsewhere to welcome the Bangla New Year 1426 with new hopes and aspirations for a better, peaceful year. People wore traditional Bengali dresses. Young women wore sarees and adorned themselves with bangles, flowers while men wore panjabi or kurta and pyjamas or lungi.President Abdul Hamid and Prime Minister Sheikh Hasina issued separate messages of greeting on the occasion of Pahela Baishakh. Meanwhile, offering her greetings on the Bangla New Year 1426, Prime Minister Sheikh Hasina has hoped that the new year will mark the beginning of a new chapter in the lives of all Bengalis. "We will continue our journey of progress. Bengalis will walk with their heads held high on the world stage. Bangladesh will rise as a developed and prosperous nation," said Sheikh Hasina. The programs of the day began at dawn in the city with the musical soiree of Chayanat, a leading cultural organization of the country at Ramna Batamul, where over 100 of singers performed to welcome Bangla new year leaving behind all odds and sorrows of 1425.Students of Faculty of Fine Arts of Dhaka University (DU) brought out Mangol Shobahajatra (procession of good wishes) in the morning. Mangol Shobhajatra is a pride for the Bangalee Nation as the traditional procession on Pahela Baishakh has got the recognition of the United Nations Educational, Scien-tific and Cultural Organi-zation (UNESCO)'s as the Intangible Cultural Heritage of Humanity.The traditional Mangol Shovajatras were brought out at divisional, district and upazila levels as it has earned the international recognition. However, business communities, especially in the rural areas, opened their traditional 'Halkhata', new account books, while sweets were distributed among customers to mark the day. The day was a public holiday.Different national dailies published colorful supplements while Bangladesh Television and Bangladesh Betar aired special programs highlighting the significance of Pahela Baishakh. Different government and non-government organizations, socio-cultural platforms including Bangla Academy, Bangladesh Folk Arts and Craft Foundation, Dhaka University, Jatiya Press Club and Dhaka Reporters Unity have organized out various programs to observe the Pahela Baishakh. Important buildings and establishments as well as city streets and islands were illuminated with colorful lights and graffiti have been painted in the walls signifying the arts, culture and heritage of the country. According to historical records, celebrations of Pahela Baishakh, started from Emperor Akbar's reign when it was customary to clear all dues on the last day of the Bengali month of Chaitra with businessmen opening "halkhata" or new book of accounts in their shops.